Last week was our anniversary, so we decided to head out for a nice dinner out to celebrate our 16 years together. 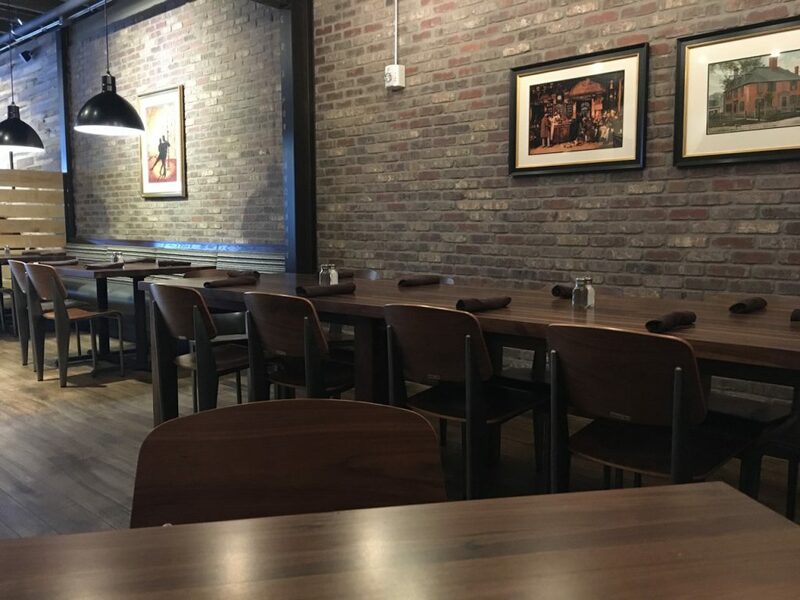 I requested to go some place new, and specifically I wanted to try the East End Grill. This is located on north Main Street, where Fuel Coffee was most recently, and before that where KDee’s coffee was. I was really worried when we got there that I was going to walk in and find yet another restaurant with TVs all over the walls playing sports. Apparently people aren’t able to eat without a TV on these days. Luckily, the restaurant was very nicely done. Clean, tasteful, elegant. There is a TV in the bar, but the rest of the place is TV free. We were seated by one of two hosts, and then took some time to peruse the menu. I was relieved to find that it wasn’t yet another restaurant with wings and burgers. Don’t get me wrong, I like wings and burgers – but I think we’re full up on those places at the moment. The menu isn’t huge. It has a few appetizers, soups and salads, a couple of burgers, and a few entrées. We inspected the menu, and while a few things looked good (my husband wanted the Shrimp and Grits and I was leaning toward the chicken), we actually were both interested in some of the appetizers, so instead of an entrée we ordered a few appetizers and drinks. Which is totally my style. 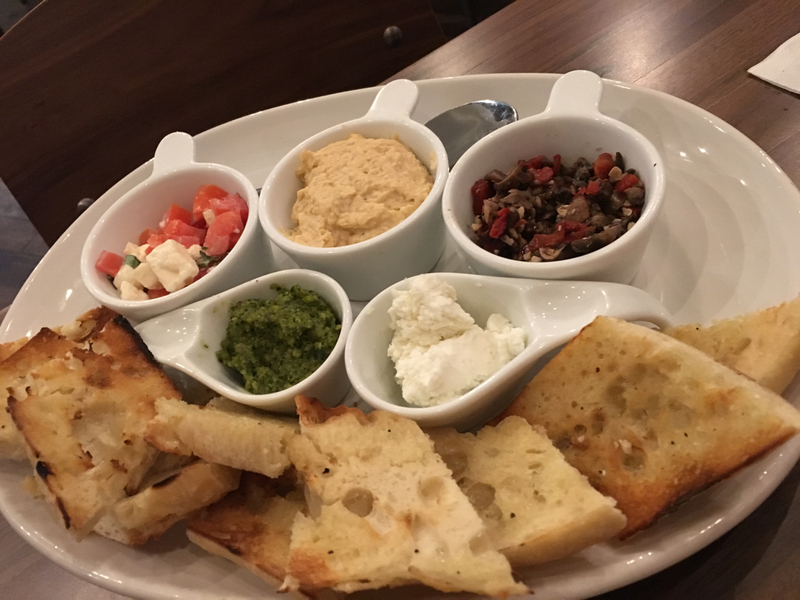 We chose the Cutting Board (selection of meats and cheeses), the house cut fries with truffle oil, and bruschetta spreads. Just FYI, this was way too much food for the two of us. You never know when you go to some of these places if it’s going to be a place with three shrimp on it or a giant plate of food when you order an appetizer. 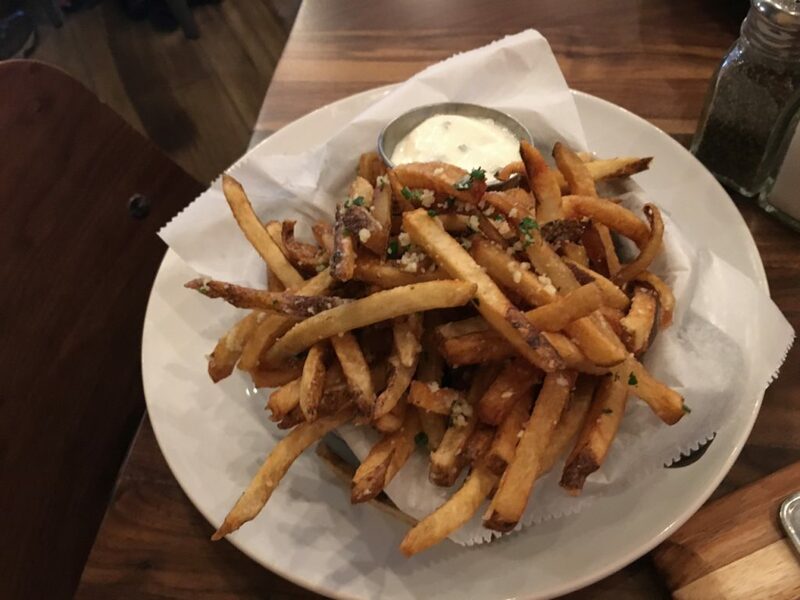 I have a weakness for anything with truffle oil, and I really liked the fries. Skinny fries with herbs, truffle oil and cheese with a dipping sauce that was really good. 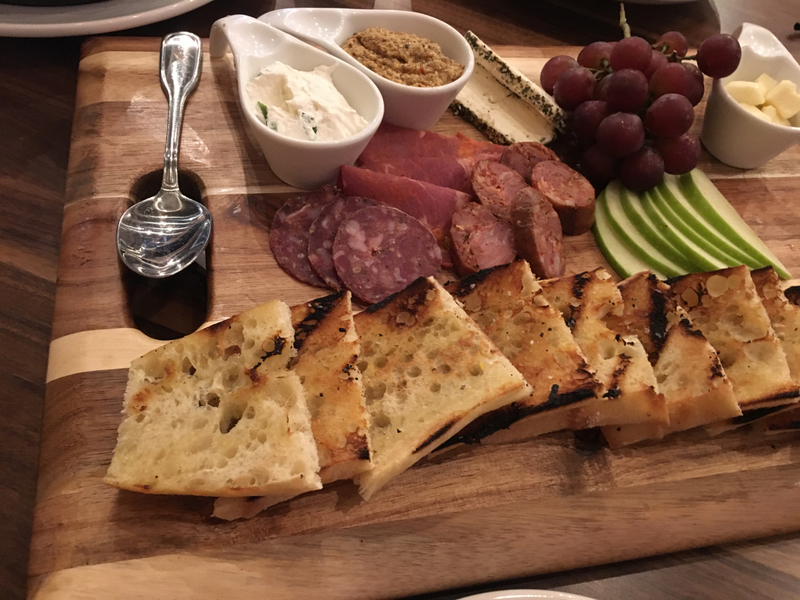 The cutting board had a variety of meats, cheeses and fruit. The server went through and pointed out what all the cheeses were and if they were local or not, which was a really nice touch. What I really don’t like is if I ask what something is and the server doesn’t know. Finally, the bruschetta spreads. This was spreads (wild mushroom & pine nuts, basil pesto, caprese, hummus, and goat cheese) and bread. It’s not extravagant, but it’s really delicious. You could put goat cheese on top of anything and I’d like it. The pesto was really good too. All through the meal our server popped in to see how we were. The owner at one point stopped by our table to chat. While the photo I took above shows the place pretty empty, it did fill up while we were there. Everyone wished us well as we left, and overall I thought it was an excellent experience. The staff was very well trained, the food was great, and the atmosphere was lovely. The prices on some of the entrées was a little steep, with the steak going for $32, but there were definitely more reasonable items on the menu. I’m hopeful that the menu will grow or change as the restaurant gets settled and I hope it sticks around for a while.